This coloring page has a hairbrush, a hamster, and some hearts. The letters H and h are below on primary-ruled paper. Color in the pictures of the hook, hot air balloon, and hat. Practice writing H h on the primary-ruled lines and then assemble the hat to wear. 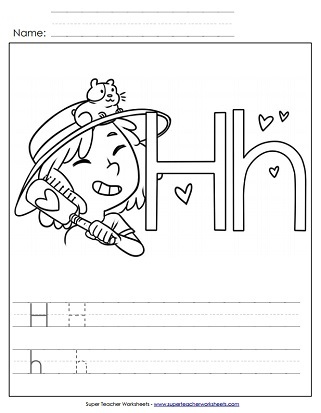 Trace the dotted lines to learn writing lower-case h on this printable worksheet. This activity directs the student to trace along the gray lines to learn lower-case letter h.
This worksheet instructs the method for writing capital letter H on the dotted lines. 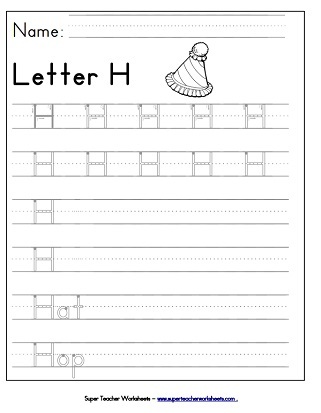 Another great worksheet to practice handwriting capital letter H.
Practice page for learning the letter H h.
This worksheet will help students learn to recognize the letter H by dotting the circles with an ink dauber.